We have installed the batteries ourselves so we can guarantee they are brand new. Fortunately as we are bulk buyers, and also a very efficient company we can offer a complete UPS, including the brand new RBC11 battery pack for a price that. Unit needs special leads to operate (C19) and hot to cold cables. I supply these with the UPS at no extra charge. The ups is ready to use from the moment you unwrap it. We also include 2 hot to cold power cables for attaching your devices. There is no issue with needing to test the performance of the batteries as they are brand new (will run for 1HR 40Mins upwards at 300 watts, thus powering most computers upto about the 4hr mark), and the UPS are all throroughly tested themselves. A heavy load power failure simulation concludes the tests and then the UPS is deemed ready for service. The UPS will protect you from power outages, spike and brownouts. It will regulate over and under voltage conditions. It will also insulate you from line noise. It can be plugged in and used straight away. We fully test and cosmetically refurbish as best we can. This is a used UPS but we have many feedback comments regarding the item being in better than expected condition. The cosmetic condition of the cases is A-Grade (retouched paint where neccesary, no major bangs / dents). 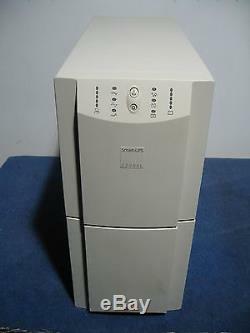 Basically this means that the ups is second user so its not exactly as it would be as new, but its in good condition. Item is heavy so you will need to help the TNT driver unload the item. Courier insured 24HR With TNT the best and most reliable courier (though a little dearer, its worth it as you DONT want an item like this mashed around in transit). People tell us that our packaging is excellent, and I have very few problems. Output Power Capacity 2200 VA Max Configurable Power 2200 VA Nominal Output Voltage 230V Efficiency at Full Load 95% Output Voltage Distortion Less than 5% at full load Output Frequency (sync to mains) 47 - 53 Hz for 50 Hz nominal, 57 - 63 Hz for 60 Hz nominal Crest Factor up to 5 : 1 Waveform Type Sine wave Output Connections (8) IEC 320 C13 (1) IEC 320 C19 (3) IEC Jumpers Battery Type Maintenance-free sealed Lead-Acid battery with suspended electrolyte : leakproof Typical recharge time 3 hour(s) RBC Quantity 1 Typical Backup Time at Half Load 24.1 minutes Typical Backup Time at Full Load 6.7 minutes. Runtime Chart Smart-UPS Interface Port(s) DB-9 RS-232, SmartSlot Available SmartSlot Interface Quantity 1 Control panel LED status display with load and battery bar-graphs and On Line : On Battery : Replace Battery : and Overload Indicators Audible Alarm Alarm when on battery : distinctive low battery alarm : configurable delays Emergency Power Off (EPO) Optional Maximum Height 17.00 inches (432 mm) Maximum Width 7.70 inches (196 mm) Maximum depth 21.50 inches (546 mm) Net Weight 112.00 lbs. The item "APC 2200 Tower UPS -Guaranteed new batts- MINT" is in sale since Monday, April 28, 2014. This item is in the category "Computers/Tablets & Networking\Power Protection, Distribution\Uninterruptible Power Supplies". The seller is "ups-trader" and is located in Stockport, Greater Manchester. This item can be shipped worldwide.